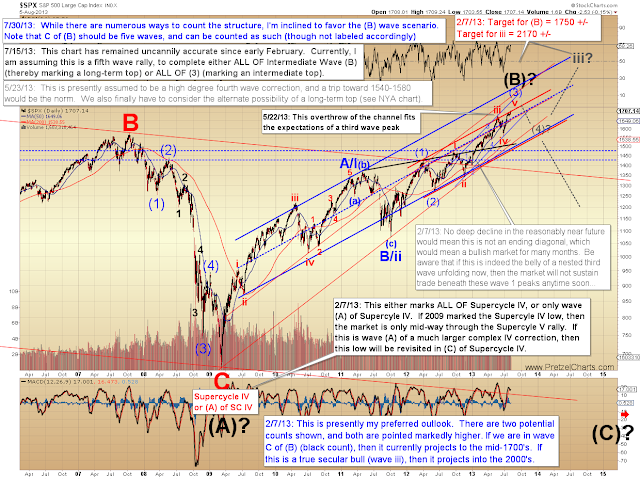 Today we're going to look at the long-term in a bit more depth. 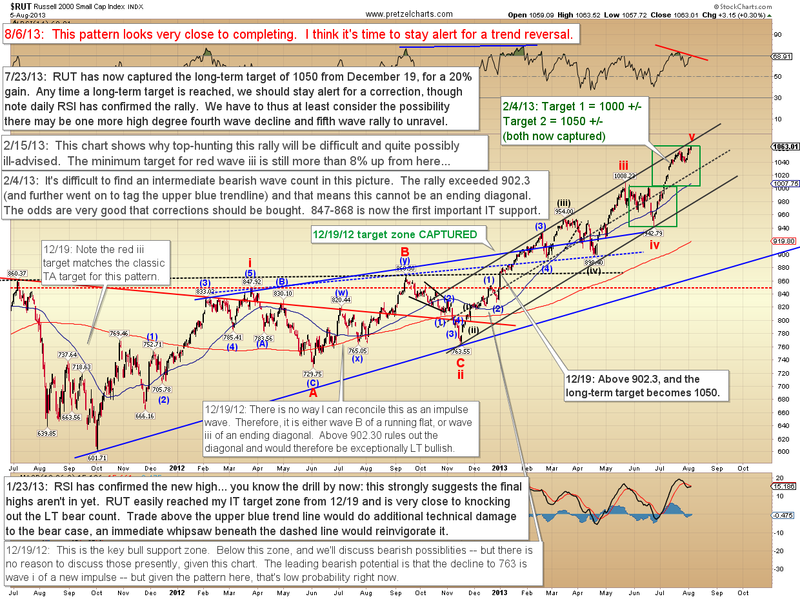 As most readers know by now, I believe we're in the fifth wave of this structure, meaning this is the final rally wave before a significant top. The wave is still pointed upwards for the time being -- so we don't want to get too far ahead of the market -- but at the same time, I think risk to long positions is increasing. The rally still seems like it's being driven by bots and algos, and according to Nanex Research, yesterday the SPDR S&P ETF Trust (SPY) recorded the lowest non-holiday volume since February 16, 2007. One can read a lot of things into that fact, but I found it of interest. 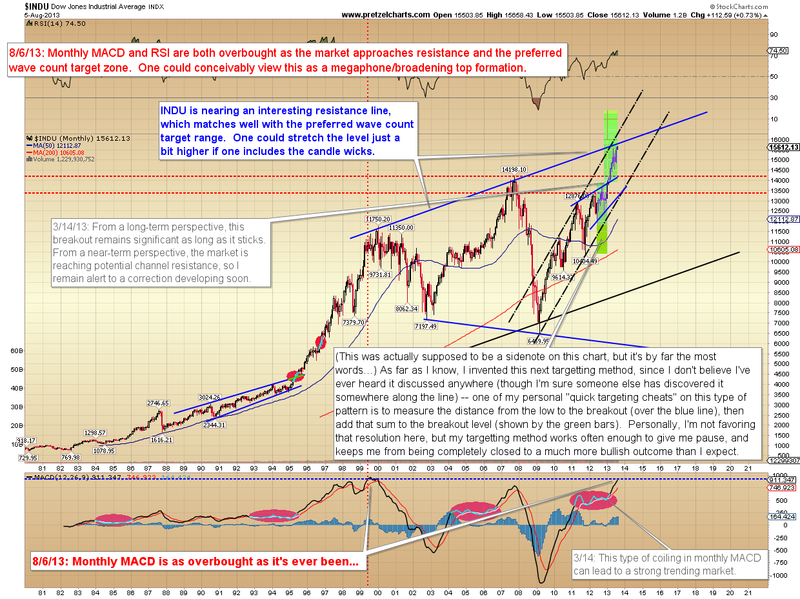 The long-term monthly chart of the Dow Jones Industrial Average (INDU) also has some interesting features. 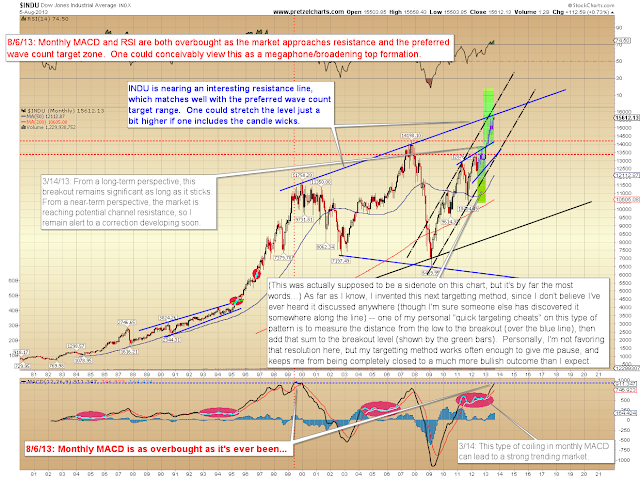 The two most noteworthy are the approach of long-term resistance (at the upper blue line), and the monthly MACD, which is now at the second highest reading in history. The record reading occurred just prior to the top at the beginning of this century (sheesh, we're getting old!). The long-term S&P 500 (SPX) chart is almost entirely unchanged since February, and appears to be putting the finishing touches on the structure. The Russell 2000 (RUT -- aka: the least appealing acronym in the industry. Who wants to own a bunch of "RUT"?) also appears to be wrapping up its five-wave structure. 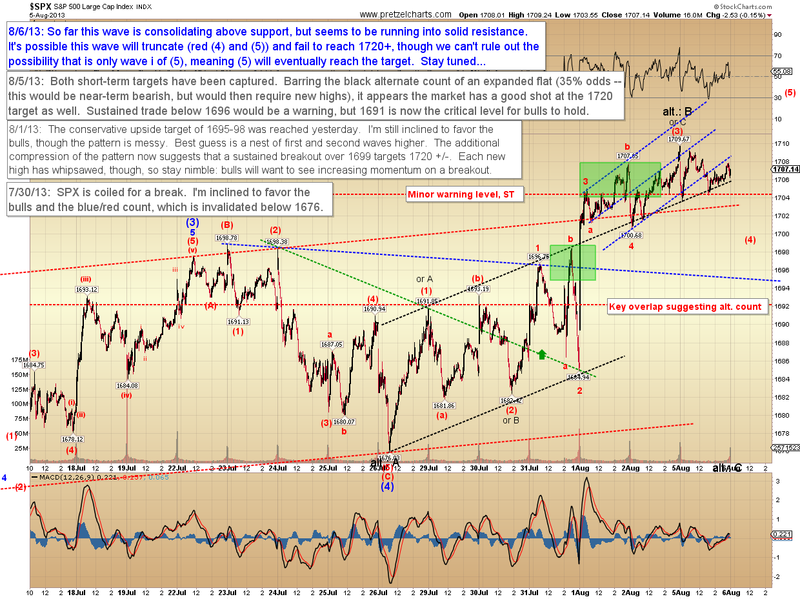 On the hourly chart, SPX may be in the process of completing its near-term five wave form. 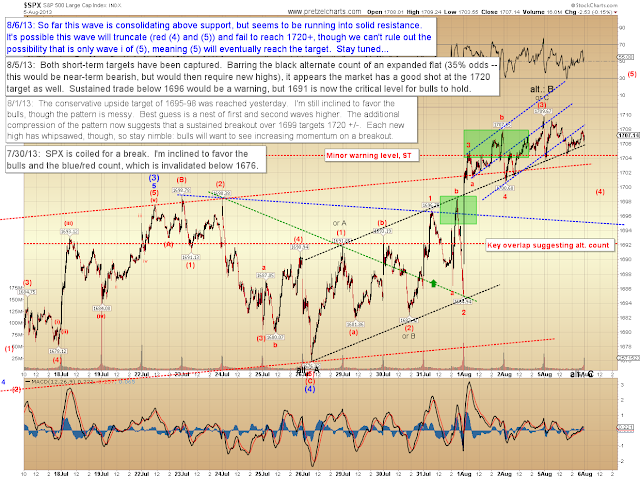 Whether this will mark ALL OF (5) or only wave i of (5) remains to be seen. I'm inclined to favor this as ALL OF (5). My best guess at interpreting the near term slop is shown below. 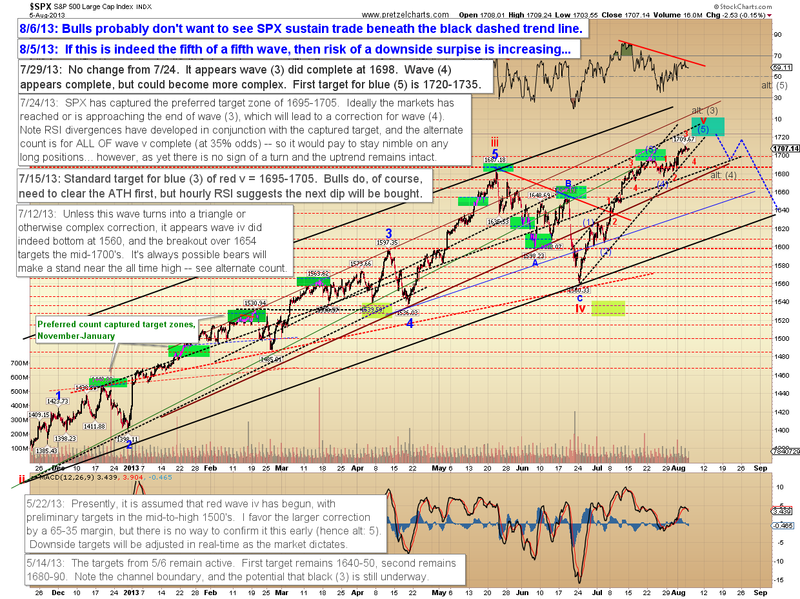 It looks marginally more likely that SPX still needs another fourth and fifth wave, but it's a really ugly wave. In conclusion, I'm a bit gun-shy about front-running this market too much from an analytical standpoint, as every surprise all year has been to the upside. 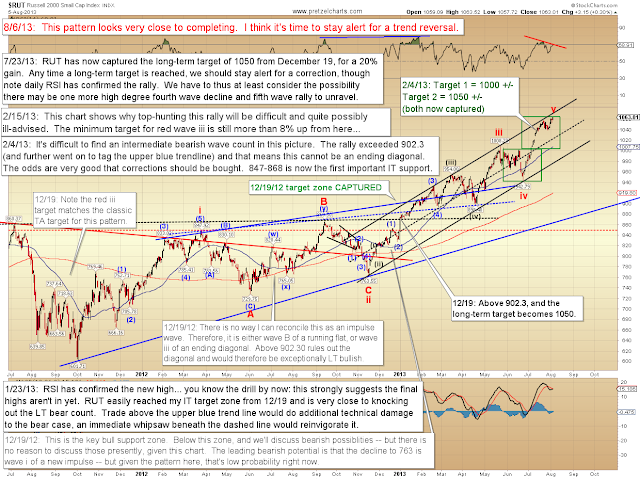 And while the wave is presently still pointed toward higher prices, I feel the risk to longs is increasing daily and the rally is most likely on its last leg. Trade safe.